Not all tarps are created equal. Indeed, what appears to be one of the simplest pieces of gear, next to a basic gathered-end hammock, tarps end up being one of the most complex. On one end of the spectrum you have the very simple asymmetric or diamond tarp that boasts only two guy lines and two anchor points. I’m not even sure there is a limit on the other extreme end of the spectrum where tarps become walled tents with doors, multiple guy lines, side walls, and even chimneys for stoves. To cover a hammock, a tarp should extend at least 6 in (15 cm) past each end of the hammock. 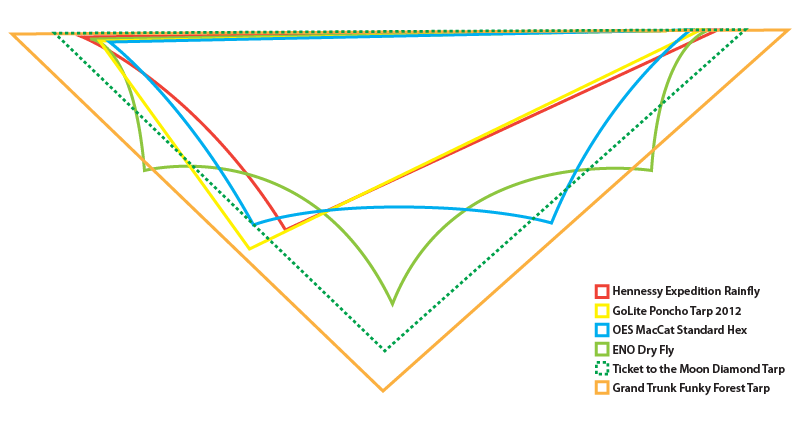 For most hammocks, a ridge line of 12 ft (3.6 m) is more than enough for maximum coverage. 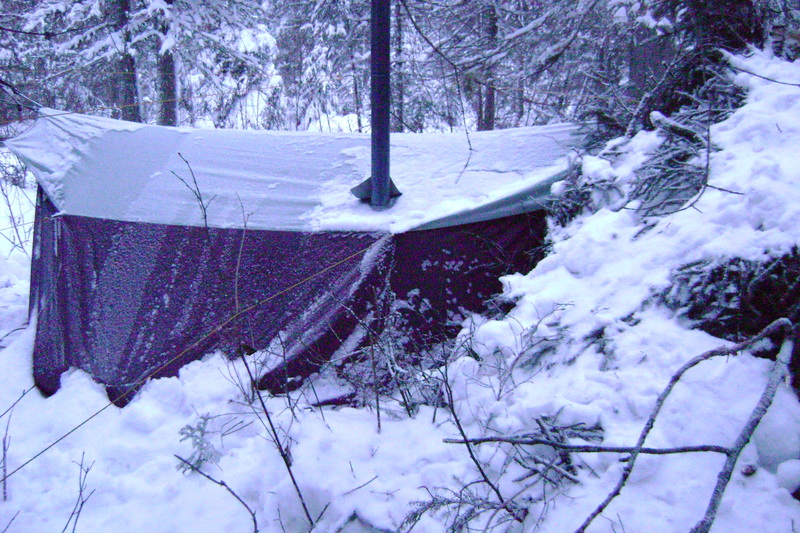 Tarps with shorter ridge lines should be hung closer to the hammock for the best coverage. Hennessy perfected the asym tarp to cover a hammock when you lay on the diagonal. It’s the least amount of tarp for the most protection, but for some it’s bikini coverage. In some ways, the popular hex-style tarp is just an evolution of the simple diamond tarp where the side panels are cut off to reduce weight on the unused fabric. Personal preference and weather conditions are prime factors on how wide, angular, or fancy the sides of a tarp should be cut. Out of curiosity sake, I took out a sample of my tarp collection to do a side-by-side visual comparison. 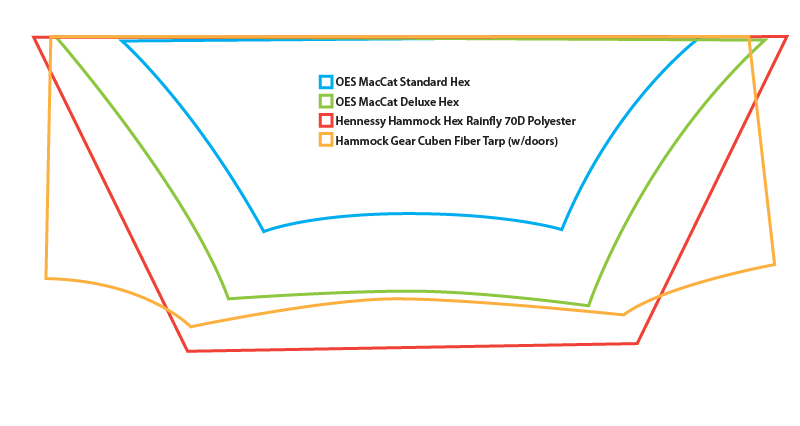 This comparison was not meant to be exhaustive, but representative of the types of tarps available to hammocks. I drew the outlines from the photographs, so there is some skewing because I used a wide-angle lens to get all the tarps in the frame. The measurements are accurate. All the tarps were centered within my 12 ft (366 cm) pipe stand. You can see that outside of the enormous Grand Trunk Funky Forest Tarp (2012 model), the other tarps all provide nearly the same coverage along the ridge line. Seeing the GoLite Poncho tarp on your list was unexpectedly cool ! It led me to wonder – what is the likelihood a Six Moons Designs Gatewood Cape might be … adapted similarly. What do you think? Very likely. Just get the dimensions and measure the hypotenuse. If it is long enough to cover the hammock, you’re good. I use hammocks of 10 feet (3 m) or less with the GoLite poncho. I currently have a 9 x 7 (11.4 ft hypotenuse) cuben tarp in .51 weight. I used to sleep on the ground, but now have a GT Nano 7 that I’d like to use the tarp with. Would you comfortable on a 5 day hike on the AT with a tarp that size to keep you dry even in adverse (rain/wind) conditions? I feel like a lot of the tarps on your list have roughly the same or smaller hypotenuses, but I still feel open to the elements. Is it me being a newb to hammocks or you wouldn’t feel comfy in a nasty storm under it either? Thanks! That’s not a bad size for a tarp. I would call it generous. I frequently use my GoLite Poncho Tarp with my hammocks, and that is small for some: 4.8 x 8.6 ft with about a 10 ft ridge line. Asym tarps take some skill to use, yet they are the standard style used on Hennessy Hammocks and with good reason: they work. In order for a diagonal pitch to work, you must lay in the same diagonal direction as the tarp and pitch the tarp as close to the hammock as possible for maximum coverage in a storm. For more info, check out my post on picking and choosing a tarp. * Just like tent or tarp camping on the ground, site selection is a key factor in staying dry in a storm with a hammock. While you can’t pick how the storm will fall, you can often pick how and where you’ll set up camp. If possible, hang your hammock on the lee side of a hill (something not often possible in a tent/tarp) to protect from sideways gusts. Sometimes the terrain will provide rock outcroppings, foliage, or dirt mounds that can also help shield the wind and rain. Hammocks provide the ability to pitch over terrain that might not be suitable for a ground sleeper, but will offer the best protection. * Pitch your tarp low and tight to the hammock. This makes it less convenient to get in a hammock, but it’s more protective. * Use a weather shield to protect the under side of the hammock. When I first transitioned from tent camping to hammock camping, I also felt “exposed.” I had never tarp camped before and I had to get used to the “wide open” feeling that the tarp provided. My first hammock was a Hennessy and with its integrated bug netting I felt more secure. Over time, I began to appreciate the views offered within a hammock and soon I was using hammocks without bug nets. If you’re not comfortable with feeling exposed, I would recommend phasing in with a hammock that has an integrated bug net. It feels more “tent-like” and protected. Have you ever seen the Mountain Laurel Designs trailstar? I know there is a chap on Hammock Forums that has managed to make his work over his hammock. Ground dweller DJZOW is a big fan and summitandvalley loves his. It’s strikes me that the five triangular panels with 2.14 metres against the ground is just one panel short of a very grand hexagonal tarp. 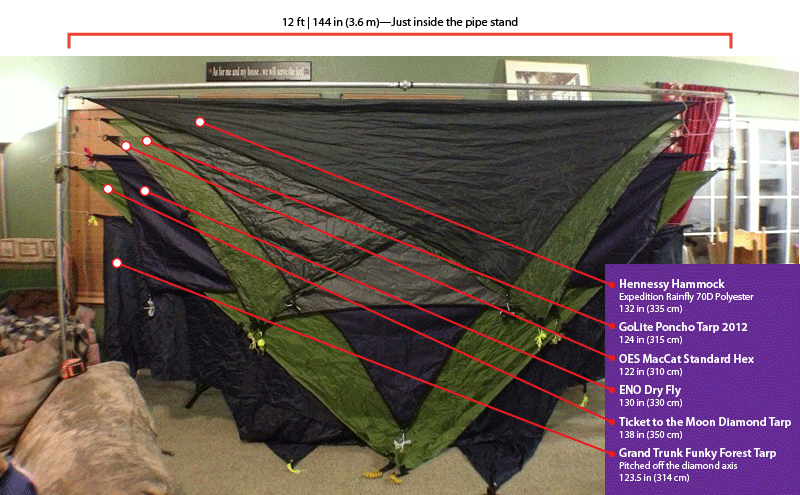 Imagine a symmetrical Hex tarp as 6 identical panels….. I have a Hammock Gear cuben fibre with doors, a Z-Packs Asym and a Hennessy Asym but i keep going above tree lines and, well, trees are useful for hammocks. I don’t want to punch a hole in my HammockGear cuben fibre (it is, after all, a work of art). If a hammock tarp had a point, right in the middle, that could tolerate an inverted trekking pole could you not fold/tie/roll/zip one of the six panels out of the way and have both an exceptional hammock tarp and exceptional minimal shelter for the ground. I wonder if Rob Bell could make that work? I’ve thought of similar designs or modifications. I even tried taking a 5-sided “pyramid” tent with the idea of pitching it as a hammock tarp (it didn’t work so well). I think the simplest design is the basic A-frame design, not too dissimilar to a hex tarp. If you are trying to find a tarp that can pull double-duty, that’s what I would recommend. I agree a 5 sided single pole tent/tarp would be awkward. I pitch both my big HammockGear Cuben and the little asyms on the ground. The big one is a bit of a bother to set up over two trekking poles and I expect I would really struggle in serious wind. The little asyms are, well, very little. The dual duty idea using a “trailstar” design is not just about getting a hammock tarp that works on the ground but getting a hammock tarp that’s an almost bomb proof tent that sheds big wind. Which is something that I rather want. More DIY it would seem? Is the Hennessy Hex 70D really 141″? I keep seeing different measurements (the HH website lists it at 132″ which would make it nearly the same size as the Maccat although in these photos the Maccat looks significantly smaller). These are my measurements of the tarps you see. There are often differences between listed and actual. Cottage vendors are usually more accurate. Tough to get a good hammock tarp in Japan without dropping a bundle on shipping. Do you think a diamond with a ridgeline of 132 inches, 106 inch width, and slight cat cuts on ridge and sides would be enough tarp for a GT Nano? Derek, what is the weight of the TTTM diamond tarp versus the stock HH asym tarp? Not much. Maybe 6 oz difference if you compare the poly hex tarp. 1.375 vs 1.75 for the Hex. Which tarp would you take if you had the choice, the Hex or a MacCat deluxe? Very similar tarps. The MacCat has more defined cat cut edges which shed wind shear better. What about a Kelty Noah’s 9 x 9? I have an ENO Double Nest and was wondering if I should upgrade to a Hennesey Hex, the Noah’s 12 x 12, or ENO ProFly? I feel a little exposed in the Noah’s 9 and worry sometimes about sideways gusts pushing rain under. Are you hanging the 9×9 as a diamond? If so, then the hex style will provide more coverage. A 12×12 hung as a square will be similar in coverage and you can pin down the edges. With the Roo, I’d get 12 ft. It also depends on how you hang your hammock and your comfort margins. The Roo is flexible and without a ridgeline can be pulled tighter which will demand better coverage. If you hang it with a good sag the 11 foot tarp will be plenty. thanks for the quick reply — I initially thought about getting the glider from kammok for the Roo, but haven’t see reviews on how well it provides coverage from end to end. I initially thought the Cuben with the doors from Hammock Gear would provide better coverage if in a down poor. the best place to start. Any recommendations on first starting out and what to buy? I hate to buy items and then upgrade later. Funds are not a real concern. The Roo is a great example of the base of a modular set up. You’ll need a bug net and tarp and whatever insulation you have. If your goal is camping and you don’t need as much modularity, going with a dedicated jungle hammock makes things much easier. Hi Derek, I just bought a eno junglenest hammock and wanted or opinion of a all around good tarp for car/backpack camping. My son is in the scouts and I will be using this set-up for the next 7 years choose wisely lol. Thanks in advance. I’d check out the GO! 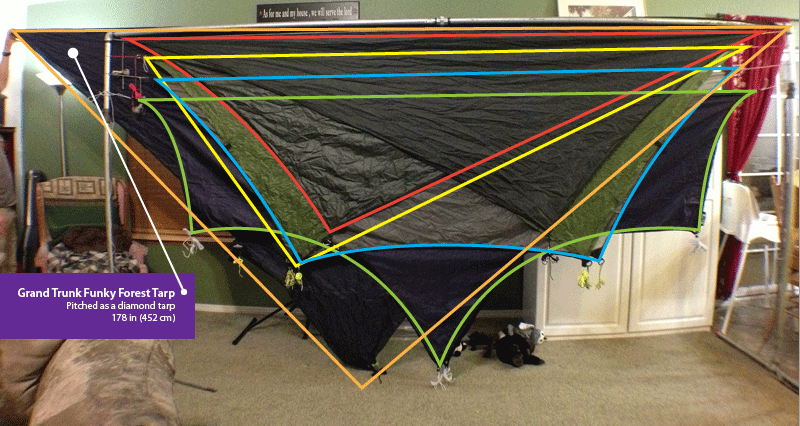 Hammock tarp I recently reviewed. How do you feel about the Warbonnet Superfly tarp? Awesome! You won’t be disappointed. I’m 6’5″ and have been looking for a good tarp that doesn’t stretch (or minimal stretch) when wet or under tension. Silpoly. I have come across DD hammock Tarp 3.5 x 3.5. Are there any other options that you can suggest? I feel like most tarps are too small for me and 11+ feet are the only way to go. SilPoly is a great fabric for what you’re looking for. Have you checked out UGQ Outdoors quilts or HammockGear.com? Yeah. I’ve looked at both and DD seems like a better deal for the price. I don’t really care for cat cuts. But I use the tie outs a lot. I feel like because of my size, the hex tarps are not a good options and asym tarps are good for the same reason. My feet or head are closer to the edges compared to square or rectangle tarps. What do you think? Hard to beat DD on price and the square tarp design is super versatile. Jacks R Better sells a huge 12×12. But I think it is nylon. Hey Derek, any chance you could do an updated comparison with some of the DCF asym tarps. I’m looking at the MLD Vs the Dutchware inparticular. Want a tarp for dayhikes using my ENO Sub7 that would keep me dry if I had to sit out a storm. Hmm. Good idea, but I’d have to get my hands on some more tarps.